Complete with trademark Pork Pie Hats and sunglasses, the legendary Brothers are back and on a new mission! Armed with a new stage set, new moves, and freshly laundered jailsuits, Jake & Elwood will hit King’s Theatre in Glasgow on Saturday 23 July as part of their UK tour. 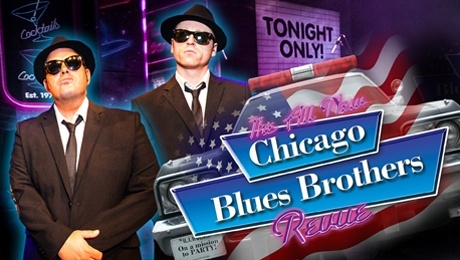 Featuring an elaborate nine-piece LIVE band, the Chicago Blues Brothers show is packed with more than two hours of the very best blues, motown and soulmusic, along with a side-splitting dose of comedy. It was all the way back in 1978 that John Belushi & Dan Aykroyd (aka Joliet Jake Blues & Elwood J Blues!) first unleashed the might that was to become The Blues Brothers on the NBC show Saturday Night Live in the US of America. But did Belushi and Aykroyd realise they would initiate an abundance of folk wearing pork pie hats and dark glasses, all professing to be on a mission from God? Probably not. What they did become, however, were the ultimate ambassadors of the music they loved! As well as featuring hits from both of the Blues Brothers movies including Everybody Needs Somebody, Raw Hide, Gimme Some Lovin, and Sweet Home Chicago, the show also includes unforgettable classics from James Brown, Ray Charles, Aretha Franklin, Otis Reading, Cab ‘Minnie the Moocher’ Calloway and many more!